Madurai: Prime Minister Narendra Modi on Saturday sought to corner the Congress on its showpiece poll promise of ‘Nyay’ (justice) and sought to know who would deliver justice for the victims of 1984 anti-Sikh riots, violence against Dalits and the Bhopal gas tragedy that happened during its regime. 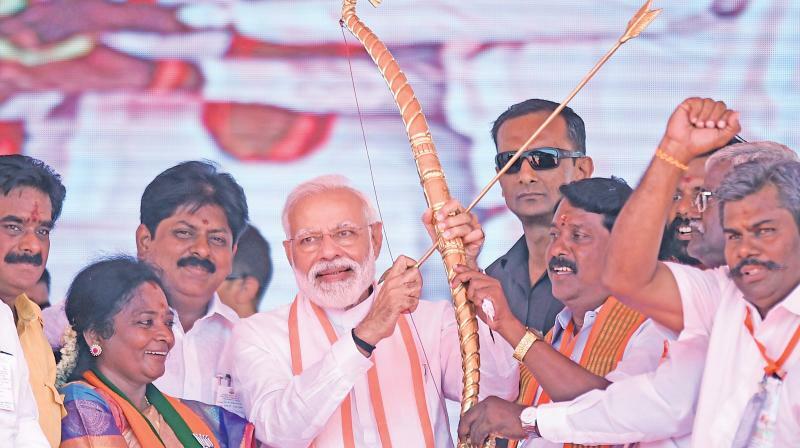 At an election rally in Andipatti, PM Modi asserted that as India's Chowkidar, he would remain committed to the security and progress of the country, whereas the Congress-led alliance “is an opportunistic team comprising enemies turned allies”. “Some days back, the DMK supremo projected the naamdar (Gandhi-dynast) as the next Prime Minister but none in their mahagathbandhan was willing to back his choice and that's because everyone is in the queue for the post, everyone dreams of becoming the PM”, said Modi. “I want to ask the Congress party who will do nyay to the victims of the 1984 Sikh riots? Who will do nyay to all the victims of anti Dalit (violence), who will do nyay to the government of great MG Ramachandran ji, which was dismissed by the Congress just because one family did not like those leaders, who will do nyay to the victims of the Bhopal gas tragedy that remains as one of the worst environmental disasters in India?” asked PM Modi. If Rahul Gandhi during his TN poll tour a day earlier invoked Tamil pride and Dravidian legacy to target BJP”s Hindutva line, Modi now countered it by pointing to the state”s spiritualism while remembering fondly the late AIADMK leaders M G Ramachandran and J Jayalalithaa and promising to protect the welfare of Sri Lankan Tamils. "I pay homage to the great MGR and Jayalalithaa ji. India is proud of these two iconic leaders who lived and worked for the poor. Their social welfare schemes ensured lakhs of people are free from poverty." BJP stood with people on the Lord Ayyappa issue, he said and hailed the state”s spiritual ethos by citing the famous hill shrine of Lord Shiva (Sundaramahalinga Swamy Temple) on Sathuragiri hills in the region. "Remember that for making a prosperous Tamil Nadu, this game of the DMK and Congress must end. We must continue working for the prosperity of our Sri Lankan Tamil brothers and we must end the dynasty rule of corrupt families," he told the crowd. The AIADMK has been accusing the DMK-Congress combine for not taking steps to halt the killings of Tamil civilians during the Sri Lankan civil war in 2009 while seeking to champion their cause and Modi”s remarks resonated it. Without naming anyone, the Prime Minister said the nation was witness to "father becomes Finance Minister and son loots the country," (during the UPA and seen as a reference to a senior leader from Tamil Nadu). "Whenever they are in government they always loot, the Madhya Pradesh government has become their ATM, they are diverting money meant for poor and children for use in their election, this has become known as the “Tughlaq Road scam”. I am sure you all know which big Congress leader stays on Tughlaq Road in New Delhi", the PM said. But he, as nation”s Chowkidar, would ensure all-round progress and secure living for the people. "None can separate the Chowkidar from the people he has come to serve", he said.